Sri Lanka has marked the 60th anniversary of independence by a bombastic display of military hardware amid high security in the capital, Colombo. 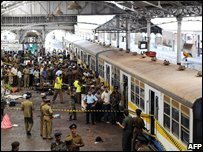 The parade comes one day after a suicide attack killed 11 in Colombo's main railway station. Security has tightened in the capital in recent months. Security checks have made rush hour traffic inch along even more slowly. It is at such times that people most dread an attack by the Tamil Tigers. "The fear has really got into people's minds," student Janani Wijetunge told the BBC News website. "You don't know when the next bomb is going to go. We still live in it. We go to school, to work, but everyone who leaves home in the morning is never totally sure if they will come back home." "We are fearing the big one," one resident said. "I can sense it is on the way, the tension is building up." Colombo is no stranger to the brutality of Sri Lanka's intractable civil war. 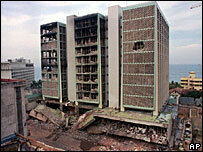 In 1996 at least 50 people were killed in a suicide attack in the heart of Colombo's financial district and in 2001 an assault on the international airport destroyed half of the Sri Lankan Airlines fleet. But within a year the Sri Lankan government and Tamil Tiger rebels had signed a ceasefire. Amid the flurry of conciliatory gestures which followed the truce, Colombo experienced a subtle but significant transformation. As the guns fell silent, the army checkpoints were deserted and a spirit of enterprise took hold of the city. Cafes, bars and restaurants opened in this period. Colombo became more attractive to foreign investors. The new buoyancy wasn't lost on its residents. "Things were looking good. People could move around more freely and there was a lot of optimism and investment," observed Rukman a Colombo resident. "It's a bit different now," he continued. "There are far fewer people out and about in the evenings. People feel much more scared." It would be easy to paint too rosy a picture of the ceasefire years. It was during this time that Sri Lanka's foreign minister, Lakshman Kadirgamar, was assassinated at his Colombo residence, a killing widely blamed on the Tiger rebels. Indeed after the hardline government of Mahinda Rajapaksa took power in late 2005 the ceasefire started to breakdown, even though both the government and rebels claimed to be respecting it. The government finally withdrew from the truce in January 2008. But this was not before a series of audacious attacks by the rebels inside Colombo such as the aerial raids in April 2007 when the Tigers launched their rudimentary air force. The government has claimed it can win the war and President Rajapaksa on Monday reminded people that the government had driven the LTTE out of their strongholds in Sri Lanka's Eastern Province. The return to violence has created a climate of fear and suspicion which has taken its toll on inter-ethnic relations. "Colombo may be multicultural but it is still divided on ethnic lines," said Dr SI Keethaponcalan, a political scientist at Colombo University. "On the surface, you see the ethnic communities getting on very well. But underneath you have a sense of suspicion and animosity. They are living in one city but mentally and psychologically they are definitely divided"
Wealthy Tamils and Sinhalese tend to have a lot in common and get on very well on the surface said Dr Keethaponcalan. But ethnic nationalism does prevail, he argues. Late night army search operations have also created a climate of fear among Tamils in the city. ""Colombo is really not friendly," said one Tamil clerk from the east who lives in Colombo. "I am always scared to go out. People know we are Tamil because of my name and when that happens we get asked so many questions. I cannot blame them because of the security situation but it is worrying and humiliating." Some, who have the option, have said they are considering leaving the country. The high cost of living and the increasingly precarious economic climate may be a deciding factor. The current insecurity of the city is a deterrent to foreign investment and the property market is slowing down. "Everything happens in Colombo. Fifty per cent of Sri Lanka's GDP comes from the western province. But if you look at local businesses, they are quite resilient. 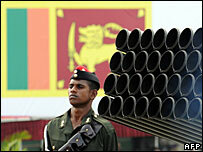 Many are used to handling the economic cost of a conflict," said Asantha Sirimanne, editor of Lanka Business Online. Nevertheless other factors, such as high interest rates, inflation and increasing rates of bank defaults could tip the balance. "We have had two tight years in a row. In 2001 there was an economic crisis - the Tigers hit the airport and things collapsed. Businesses are slowly grinding to a halt, but they haven't ground to a halt yet," said Mr Sirimanne. Reports of the army clearing small businesses off the pavements for security reason do little to shore up confidence. "If the Tigers hit the port, if there is just a little push, that could be it," predicts Mr Sirimanne. "The conditions are ripe and it doesn't look good."